Fruitless Pursuits: Kaiju Kaos Smackdown: Limited Edition Miniatures Game Release! 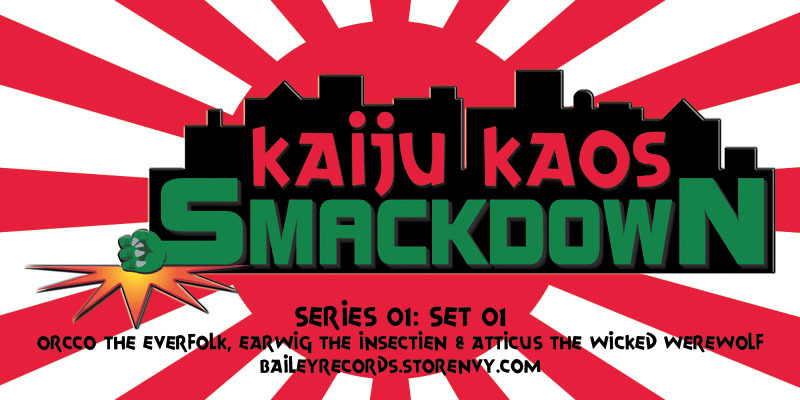 Kaiju Kaos Smackdown: Limited Edition Miniatures Game Release! This is interesting. Bailey Records, a record label that produces roleplaying and miniatures game soundtracks, as well as comic book soundtracks (I swear, here's proof.) produces their own miniatures game called Kaiju Kaos. It's a big tabletop skirmish game featuring "humans, werewolves, scarecrows, zombies, Giant Apes, and Colossal Kaiju" and the new version of the game, Smackdown, is a quick (what?) and small (crazy!) miniatures game. 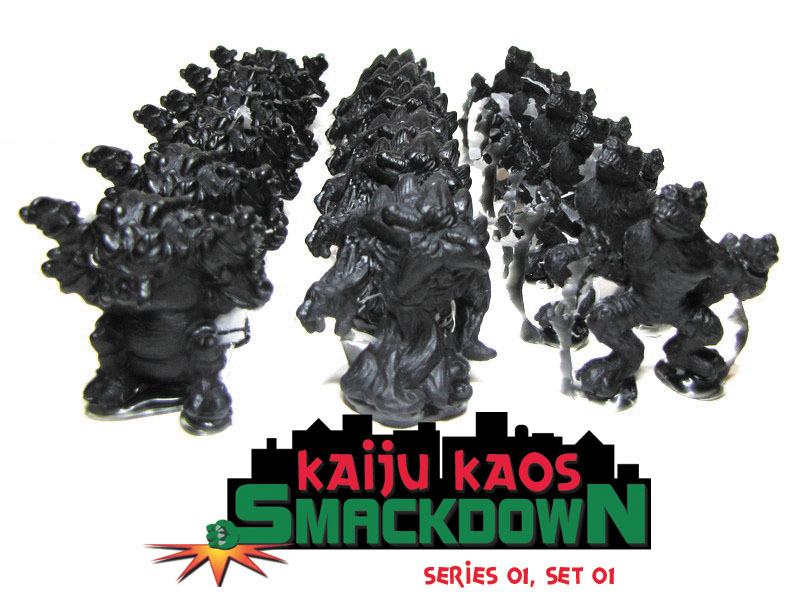 A new set of limited edition black cast figures for Kaiju Kaos: Smackdown are being released tomorrow night. There are only 40 sets being produced, and knowing today's demand for miniatures... they won't last long. This game seems to go right for the gamers gut too. The combination of character types PLUS Kaiju? It's too cool. The first run consists of Orcco the Everfolk / Martial Artist Orchid Titan champion, Earwig the Insectien / Scout Specialist Battler Beetle and Atticus the Wicked Werewolf / vicious Saboteur. Click through the jump for more images and info. 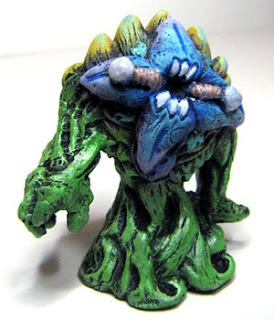 KAIJU KAOS is a tabletop miniatures game where two or more players pit their hand-painted metal and resin armies against one another. KAIJU KAOS is a strategic skirmish game. It’s not just a matter of liningup models on the table and the person who goes first is the winner. KAIJU KAOS requires cunning and adaptability because at any time an opponent can drastically alter the current situation with an unexpectedaction or a lucky roll of the dice. A solid strategy and good implementation combined with a little luck willenable the weakest troopers to bring down the mightiest monster. There are various unnamed troopers and specialists to build armies with, but the true heart of KAIJU KAOS is in the characters – whether they’rehuman, Kaijin, or colossal Kaiju bent on destroying everything in their path. KAIJU KAOS: SMACKDOWN is a “death match” variation of KAIJU KAOS where players quickly battle using one or more 45mm tall character models on a 2x2 foot tabletop. The object of the game is to bethe last model standing by defeating your enemies. Every faction in KAIJU KAOS, along with a healthy dose of Mercenaries, will be represented in SMACKDOWN. Each set of minifigures will contain one of each character sculpt and the initial release will be limited to 40 sets cast in black resin. In addition to sculpting, Steven is handling all the production of the initial release. The sets will be released online this Friday evening at 8pm EST at baileyrecords.storenvy.com for $25.00 a set. Once the limited edition black sets sell, regular production of each figure will resume at Acheson Creations in our standard gray color. More limited edition colors may appear from time to time if demand warrants. More sets will be released quarterly throughout 2013.